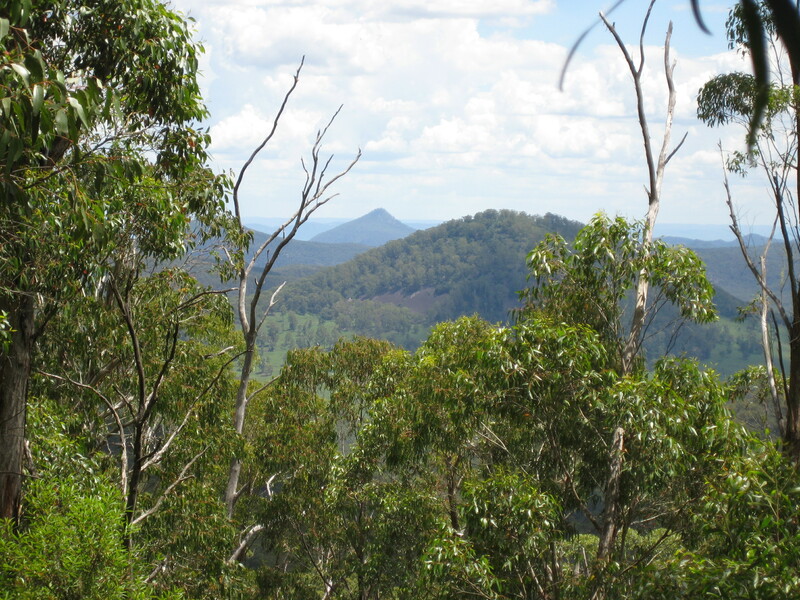 Mt Coricudgy is approximately 36kms from the rural township of Rylstone. 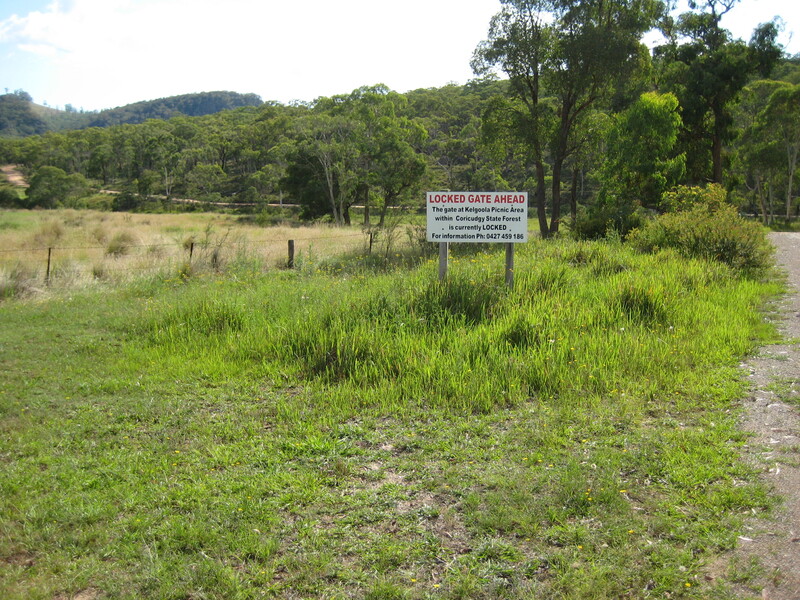 At the Rystone Hospital is the bitumen road leading to Olinda where there is a RFS fire shed. At the fire shed is an intersection, continue straight on through scenic farmlands. Soon after Olinda the road becomes unsealed. Further on the road is signed 4WD vehicles only. A 2WD with good ground clearance will get through, note that the road may become impassable to all traffic during bad weather. Sign advising of locked gate ahead. There are some bad boggy sections. 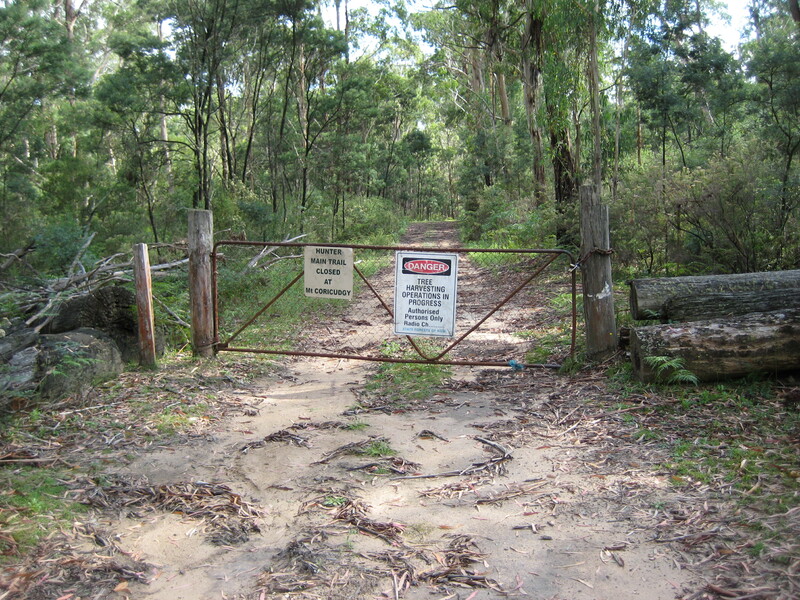 After passing Dunn’s Swamp turnoff keep going until you come to a locked gate which marks the boundary of the Coricudgy State Forest. Plenty of open parking here, from hereon access is either foot or bicycle. Arriving at the locked gate parked the car and manouvered my laden bicycle past the gate pedaling slowly along the track. Some sandy sections made steering difficult at times. As I was carrying 8 litres of water progress was slow. Riding was only possible for a kilometre or so after that the track becomes very steep and from then on becomes slow push for nearly all of the 8.7kms to Mt Coricudgy. In the full summer heat had many rest stops to recover. Steeper and steeper the track became, at the upper levels came into cool groves of ferns and tall stands of timber. A Forestry sign indicating the way to Mt Coricudgy. There are some excellent views when the higher levels are reached despite the tall timber. After much exertion came to the basalt plateau where it was possible to get back onto the bicycle and ride the last 2.1km to the trig at Mt Coricudgy. 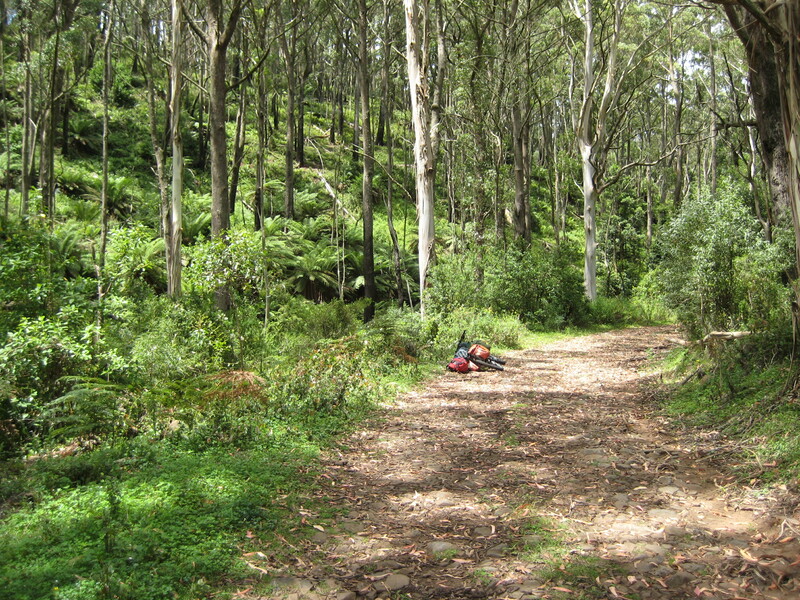 On the plateau there is a lot of hardwood logging and a number of side tracks. The main track comes to a Y intersection, take the right hand fork. This is the main track to the trig which is on a small knoll. Upon reaching the trig was surprised to find to two radio communications towers. Set up my humble fly tent and rolled out sleeping bag etc, strung the dipole up and started calling on 30M. Mobile phone access is very poor at Mt Coricudgy, the only reliable signal spot was just to the left of the older radio hut about 200 metres away. A lot of running to and fro to make spots and announce band changes etc. Started calling around 0730 on 30M with only one contact,VK3PF at 0736Z, over to 20M, Tony VK3CAT and two DX chasers DL3HXX and DL2HWI. Was pleased with the two DX contacts as was only running 5 watts. Very strong winds started blowing and the resulting noise made even the headphones hard to hear at times. Otherwise would have stayed on air for later in the evening. Generally 30M is a good night time DX band. 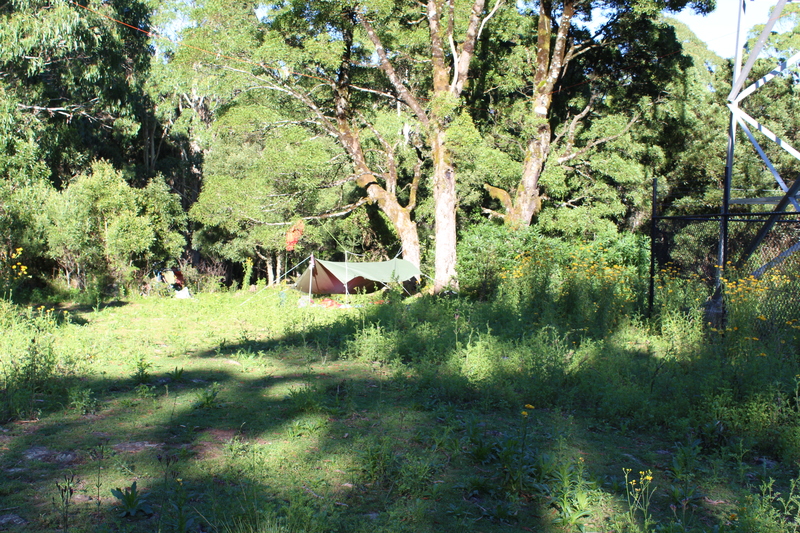 My pleasant bush land campsite in amongst the trees. Sleeping quaters and the radio shack. Saturday 17th a cold change had come through during the night making it a chilly morning in my rudimentry fly sheet shelter. Started calling on 20m around 2100Z with no result, over to 40M with 10 VK chasers till rollover at 2400Z. After rollover worked another 6 VK chasers and closed down around 0040Z (11.40AM). 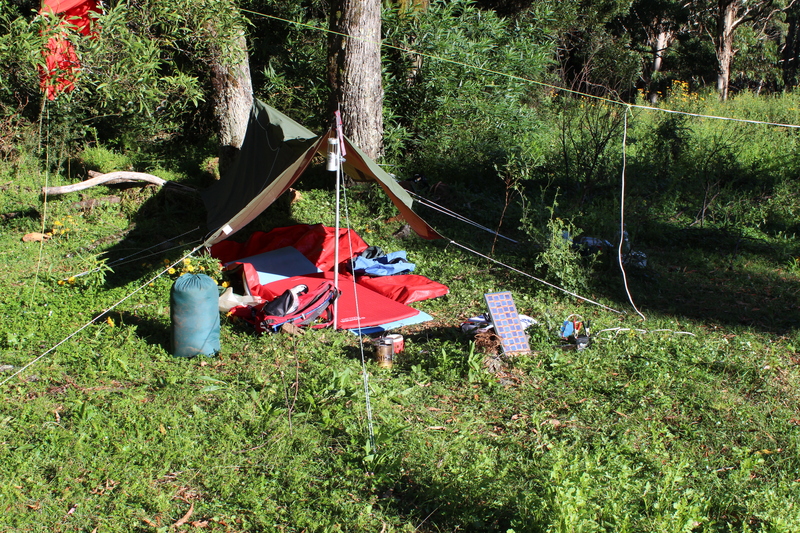 Although pleased with the 1st time activation of this hard to get to summit was sorry to repack the bicycle and leave such a pleasant campsite. 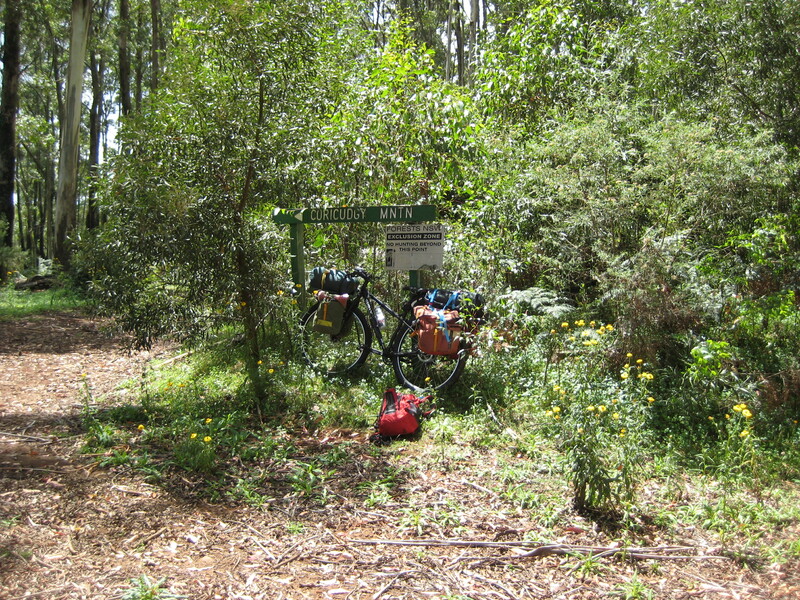 In retrospect had a bit of time and should have gone for a ride to the Hunter Trail at the boundary of the State Forest to take in the views of the rugged Wollemi National Park. Next time will do so. 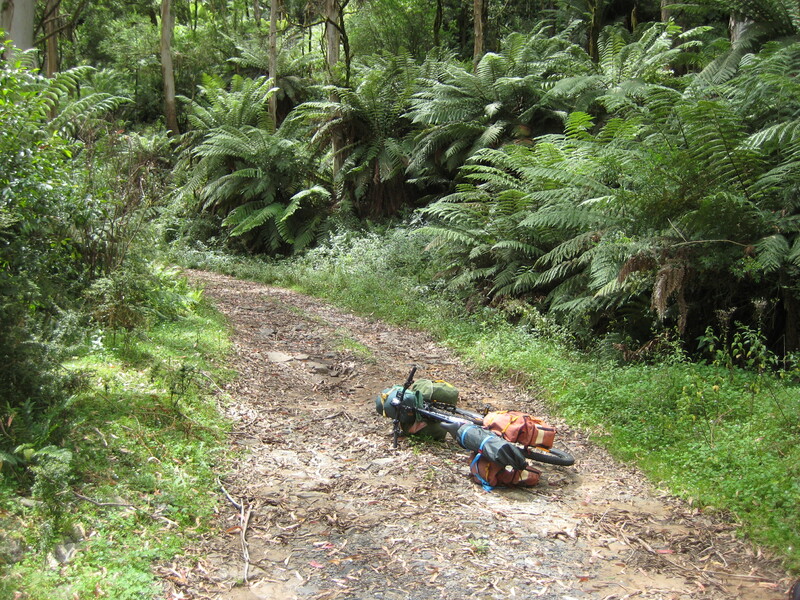 The ride back was uneventful taking care not to spike a tyre on the many sticks along the Coricudgy plateau. Naturally the descent was very quick and my hands became tired from the constant braking down the steep mountain. At the lower levels negotiated the sand bogs again and back at the car in good time. So ended the first time activation of Mt Coricudgy. I logged a distance of 8.7km from the gate to the trig on my bicycle odo. On this occassion used my KX3, linked dipole with a 1:1 balun and a 5 AH gel battery. My first attempt with the Pico Paddle and these are a bit of a handful to get used to. Made a number of errors. Mt Coricudgy is well worth a visit despite the steep climb. I believe there may be a water source somewhere on Mt Coricudgy but have no information of its location. Prudent to carry water unless certain as the water may possibly be some distance from the SOTA designated summit in any case. ← SOTA Nullo Mountain VK2/CT-017, Mount Cox VK2/CT-025 and Mount Pomany VK2/CT-023. SOTA Nullo Mountain VK2/CT-017, Mount Cox VK2/CT-025 and Mount Pomany VK2/CT-023.